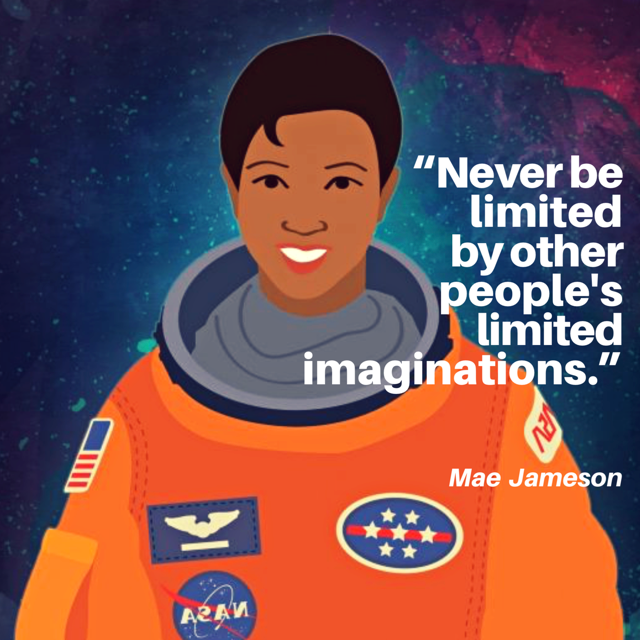 Growing up, Mae Jemison knew she would go into space. She said she didn’t care if there were many women or African-Americans did that before her, but her luck made her the first African-American woman ever traveled in space. She joined the mission STS-47, by which she spent 190 hours and more in space, from September 12th to 20th, 1992. Soon after that, she resigned from NASA, in March 1993, for the reason that she wanted to study the relationship between social science and technology. She had been a professor, educator and public intellect, gave speeches to commencements, enrolled in organizations, such as American Chemical Society, American Medical Association, and Association for Space Explorer, and later established her own companies. In later part of her career, her job was to arouse the interests of minority students into science, including writing a memoir for children. Take a break to see one of her TED talks where her topic is arts and science. Everyone knows that she is a scientist and chemical engineer, but not that many know she was also a professional dancer, when she was a teenager. There was a chance that she might become a known dancer, but instead, she chose to study science at Stanford University. She made such choice, because her mother said she could still dance if she studied science, but not vice versa. She pointed out, in the talk, that there is a link between science and arts when people tend to make them two different fields. She said dance helped her a lot in the training of being an astronaut. Here she shares, “Science provides an understanding of a universal experience, and arts provide a universal understanding of a personal experience”.